I love colorful K Bell socks! 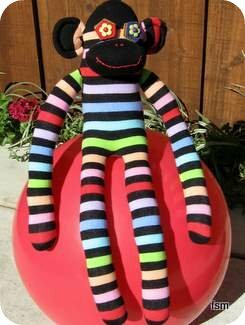 I love to wear them and make sock monkey toys out of them. 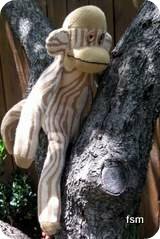 They are great of you are looking for animal socks as they have a variety of animal patterned socks such as cow socks, leopard socks, giraffe socks, zebra, pig, cat and dog socks. The women's novelty socks are very cute, like the Mary Jane striped socks and there are many other crazy prints which are bright and fun to wear. From a sock toy making perspective there are a lot of cool socks that look great as sock animals. 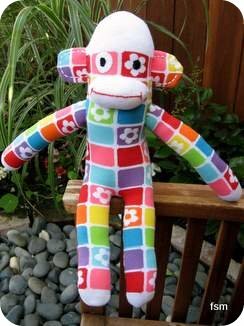 Here are a few sock monkey dolls I have made from KB socks. If you are looking for polka dot, leopard print, pink, bride, love, music, metallic, ladybugs, fishing, jazz, spots, argyle socks or any other sock that rocks, KB socks might have what you're after. 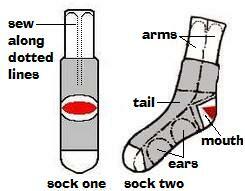 There are no show socks, ankle, trouser, knee high and over the knee socks, socks with toes and non skid socks. 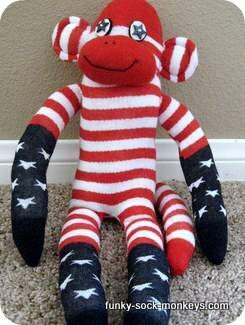 For making a sock monkey toy I find it best to use the trouser length or the knee highs. 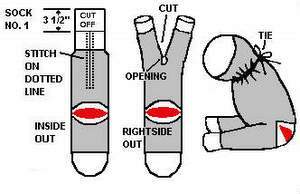 There are photos of homemade socks toys in our gallery and if you feel inspired to make a sock animal there are free patterns and instructions to help you on your way.